HERO (2003) Design: Hero of Alexandria, Director: Barbara Webb, Construction & Programming: Telluride HERO group including Peter Asaro, Richard Reeve, Shana Mabari et al., Only successful "live robot" demonstration in Telluride Summary Reports: Peter Asaro. reconstruct his design using Lego in one three-hour session. Alexandrias On Automaton-Making, History of Technology 17:1-44). It consists of a cart supported on three wheels, one a castor wheel and the other two drive wheels. The wheels are powered by a descending weight. 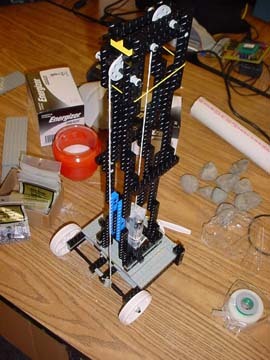 By winding a rope connected to this weight around the wheel axles the cart drives forward. 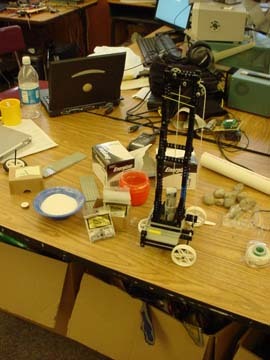 Reversing the rope winding direction alters the direction of the robot. Hero describes how to wind the robot in various patterns, including slack that results in pauses, to produce an arbitrary robot path. We constructed a Lego base approximate 14cm square, with a single castor wheel and two drive wheels of 5cm diameter on a single axis. A tower approximately 40cm high was mounted on top of this. Originally this was intended to contain a tube that slowly leaked sugar (Hero recommends using millet seed) from the bottom to control the rate of descent of the weight. 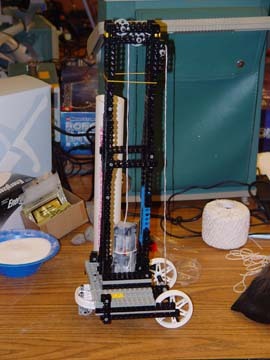 However it was found that this arrangement provided very little torque, certainly not sufficient to overcome the inertia of the robot when its weight rested on the wheels. A drawback here was also that the lego axles are not rigid and thus add substantially more friction than a better engineered system would. Instead we used the weight in free descent (the robot was powered by 8 AA batteries taped together). A string was attached to the weight and ran over two pulleys then down to the main axle. We needed to increase the axle size to increase torque, resulting in a total travel of 10 wheel rotations for the descent of the weight over 30 cm. With this system we were able to successfully deploy the device on a smooth floor and demonstrate an automatic switch from forward to reverse motion. If time had allowed, it might have been possible to de-couple the two drive axles, use two strings from the weights to control them separately and thus create more complex motor patterns. More advanced behaviours might include a switch/lever to detect collisions and alter the movement appropriately, e.g. by stopping one weight and releasing another that drives a turn. However, such advances would probably require a better base construction (i.e. not Lego). In summary, we showed that the basic principles described by Hero were sufficient to construct a simple mobile robot using only mechanical principles. Adhering more closely to his precise specifications for construction would probably produce a more efficient device.